Ride back in time when our train carries a gold shipment only to encounter... bandits on horseback. Kid-friendly and fun for the whole family. Ride back into history when our old-time train carries a -gold- shipment. the robbers are planning an attack with their horses and guns to rob the train of its gold and the passengers of their -play- money. 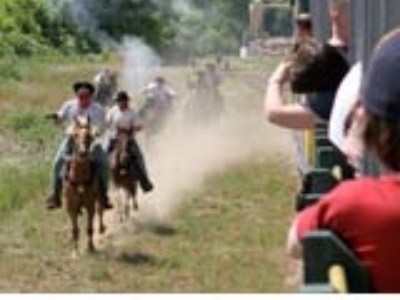 This thrilling trip is fun for the entire family and one of our most popular trains. Train dates: Saturday, June 9, July 7, and August 4, 2018. This round trip train is scheduled for a 6 p.m. departure. Advance reservations are highly recommended for this train, as it typically sells out. Seating is made on a first-come, first-served basis and are not assigned regardless of reservation. No restrooms on the train, but facilities are in the depot. Please plan to arrive at least 45 minutes prior to departure. Duration of ride: Approximately two hours.